Our house offers spacious self-catering rental accommodation, conveniently situated above Doussard, overlooking lake Annecy. The house offers easy access to Annecy, the old town, the lake and the nearby mountains, including the ski resorts of Megeve, La Clusaz and Grand Bornand just 35min drive away. Our house is situated walking distance from the market town of Doussard. The three bedroom accommodation is suitable for families, small groups and individuals. Our house is available for weekly or monthly lets throughout the year. Our 1500sqm secure garden is ideal BBQs and safe for children. 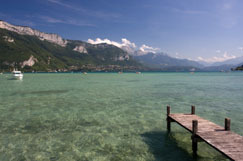 Relax with a BBQ overlooking lake Annecy in the pieceful surounding of Maison Shanti. Enjoy the website and hopefully welcome you soon for a stay in our house. 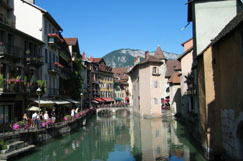 Whatever you, your friends or family enjoy doing during your vacations, lake Annecy got it all. Enjoy lake-side walks during spring, water-sports during the summer, walking in autumn and skiing in winter.